This image, snapped by JP Hallet in the 60's, shows the beginning of a children's game traditionally played by Efe Pygmy kids in the Ituri forest of the Congo. The moment I saw this photograph I fell in love. Tracking down the photographer (who was an extraordinary man), I hoped that one day I would be able to make this image available to others. Now I can. You can read the full story of how the game works, and find out how the image came to be. The Circle Game has been shared by millions of people on social media, often with an incorrect tale. I wanted to correct that. To find the "In a Word" card line which highlights words from cultures that express universal sentiments not found in English, please check out my Etsy shop. There you'll find expressions related to compassion ("Ubuntu"), guidance ("Istikhara"), elegant aging ("Shibui") and more. There are also fictional words (like "Q'apla!" 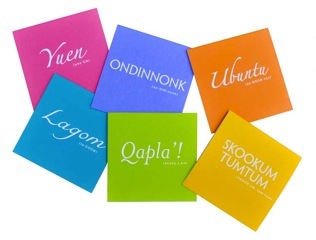 in Klingon, which is a wish for someone's success) and endangered words (like "Mamihlapinatapei" – the unmistakable look of shared understanding– in Yaghan, a tongue with one remaining speaker). I've moved all word card sales to Etsy, and offer pre-pack discounts there. I hope you'll take a peek. Thanks!